After a bit of a unexpected delay (the other photos weren’t taken down yet!) my photos went up today. I dressed for the occasion – at 6 months pregnant I found the floofy skirt very forgiving on pregnancy bellies – I bet in another week I won’t be able to close that bodice! I learned something really important. I either need to dry mount my photos (which I can’t afford at this time) or I need to reprint them with larger borders so the mat can hold them flatter against the back. I’m getting some sagging lines :( But better to learn that now so I can re-do it before more photos go up in Barefoot Coffee Roasters in August. Soooo… everything will have to be reprinted and reframed. So much for getting it done early. I bet the photos will look better at night without all the stray sunlight attacking them from every window. So I plan to go back tonight and see if they look better. It feels great to finally get some of my work up in the real world. I love this website but having them physically hanging somewhere feels good. 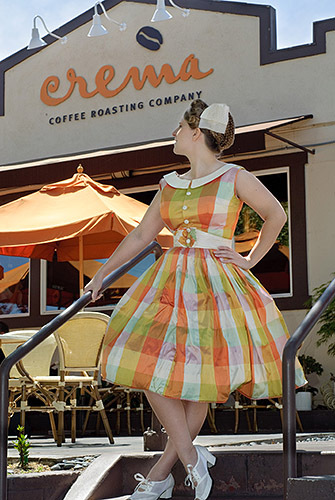 -Going to go Google Barefoot Coffee Roasters now as I don’t know where it is.